I know what you’re thinking: ‘oh, great, another ill-fated Unreal 4 remake’. It feels like most weeks we see another classic prettied up in Epic’s latest game engine, only for it to be quickly cancelled shortly after. Well, this one’s different, as it’s literally just someone’s uni coursework. BioShock is a stone cold classic, just like much of our list of the best PC games. 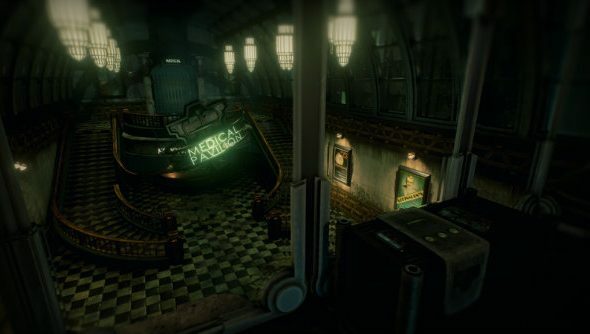 BioShock was originally created in Unreal 2.5, so this project gives Rapture’s underwater halls a significant visual boost. It’s not Rapture in its entirety, of course, but rather a slice of dystopia – specifically, the Medical Pavilion. The map is the work of Ross Littlejohn, an environmental artist from the UK who created it as part of his university coursework. All assets in the video were modelled and textured by him, aside from foliage and the original Bioshock artwork seen within. Judging by the rest of the work on Ross Littlejohn’s site, he shouldn’t have much trouble getting a job in the industry once the course is over, whatever the outcome.